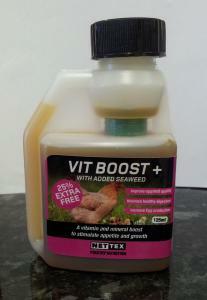 NET-TEX Vit Boost + with added seaweed is a vitamin and mineral boost that helps to stimulate appetite and growth. Will help to improve nutrient absorption, stimulate appetite and growth during periods of nutritional imbalance and aid in recovery from stress. (seaweed is rich in vitamins A, D & Iodine). Add at a rate of 5ml to every 4.5ltrs of drinking water.